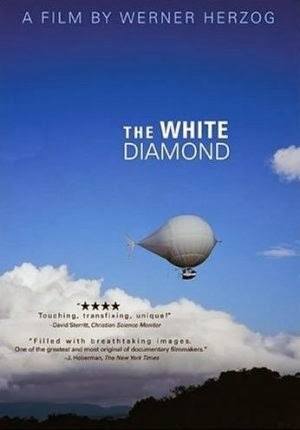 Werner Herzog’s 2004 documentary The White Diamond introduces us to Graham Dorrington, a London-based aeronautical engineer who’s designed an airship that, if successful, can be used to study rainforest canopies, an area that, thus far, has been relatively unexplored. To test his ship, nicknamed The White Diamond, Dorrington travels to Guyana, South America, setting up camp next to the picturesque Kaieuter Falls (which, at over 700 feet, are four times as high as Niagara Falls). Yet as excited as he is at the prospect of exploring the rainforest canopy, Dorrington is also trying to come to terms with a tragedy that occurred eleven years earlier, when wildlife cinematographer Dieter Plage was killed while testing one of the engineer’s previous airships. This is the central story that makes up The White Diamond, but in no way is it the film’s sole focus. Using Dorrington’s airship as a starting point, Herzog then branches off in several different directions, showing us everything from the white-tipped swifts, a breed of bird living in a cave behind the falls, to a diamond mining operation, where we get to see an authentic white diamond. Along with this, the director spends quite a bit of time talking with Marc Anthony Yhap, a Guyana local who waxes poetic about the beauty of flight and speaks openly of his desire to visit his mother in Spain. In one of the movie’s most interesting sequences, Herzog even provides archival footage of Dieter Plage, including some harrowing material the late cinematographer shot while living among the gorillas of Africa. Whereas some viewers may take issue with Herzog’s perceived lack of focus, I found The White Diamond to be a fascinating experience, and I applaud the director for allowing the film to grow organically, traveling well beyond the borders of his original story. While Dorrington’s ship remains an integral part of The White Diamond, it’s but one of several intriguing elements the movie presents over the course of its ninety minutes.